Late this summer, Jacob Kubel, a conservation scientist with the state Division of Fisheries and Wildlife’s Natural Heritage and Endangered Species Program, was slogging through a Sudbury wetland, searching for a new species of leopard frog, when something unusual caught his eye. Leopard frogs, which are named for their dark spots, are usually green, beige, or some combination of those colors, but one of the blurs Kubel saw through the stems of sedge and grass appeared to be bright blue. Kubel said he didn’t think much of it at first: Individual animals in many wildlife species, after all, vary greatly from one another. But when he captured the 2-inch frog and looked at it up close, he realized it was something he — in fact, most everyone — had never seen before: a blue-colored leopard frog. “It was truly blue, without even a hint of green,” said Kubel. 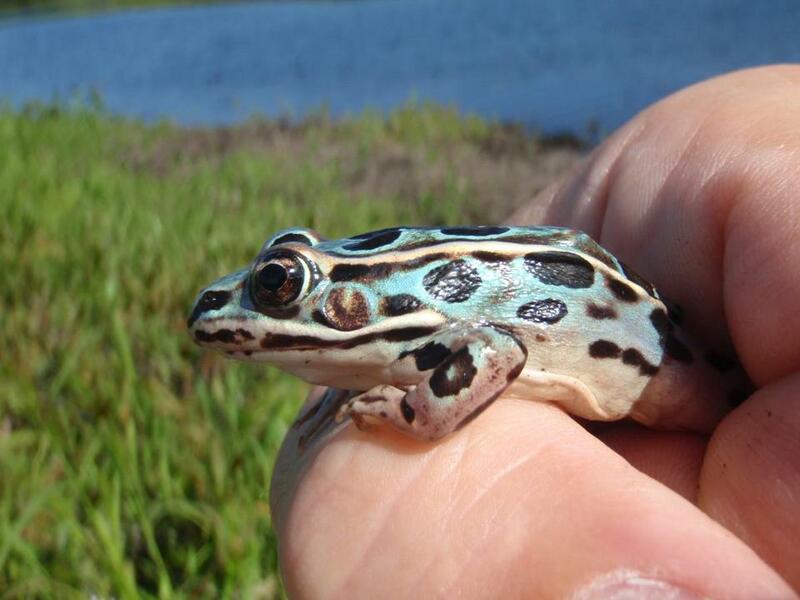 Kubel said green and bull frogs, two other species found in Massachusetts, sometimes tend to be blue or partly blue, but blue leopard frogs are extremely rare. As in: one in 300,000 specimens. That’s Kubel’s best estimate, based on a 1960s study across the United States and Canada of the genus that includes leopard frogs. Conceding there may be cases he’s unaware of, Kubel knows of only three such recent discoveries: a blue leopard frog found in New Jersey in 2003, one in Delaware in 2007, and one in New York earlier this year. When he made his remarkable discovery, Kubel was looking for something exciting in and of itself: a new species not yet found in Massachusetts. It was just two years ago that a new type of leopard frog was found on New York City’s Staten Island. Now, scientists like Kubel are catching leopard frogs across nine states, extracting genetic material to determine whether they are members of the still unnamed species. That extraction is a lot less painful to the frog than you might think: To obtain a tissue sample, said Kubel, researchers clip a small piece of a single toe. Because of the limb-regeneration capabilities of frogs and other amphibians, the toe clip is considered to cause minimal, if any, harm, he said. The frog is then released at the point of capture, after a few photos are taken. It’s those photos of Kubel’s frog that capture what’s most striking about it: its beauty. Its blueness represents no scientific breakthrough, merely a gorgeous aberration. The normal greenish or beige colors of leopardfrogs, he explained, have much to do with the yellow pigment ususally found in its skin cells. Those cells are generated in a structure called the neural crest during embryonic development. Kubel said that a blue frog is a natural phenomenon that occurs when the yellow pigment cells are absent, either because they fail to develop or they migrate from the neural crest to other parts of the frog’s body. Such eureka moments are few and far between as he navigates through mucky swamps, dense vegetation, and swarms of biting insects. But Kubel said his love of nature — and helping to counter the threats that native wildlife face — provide plenty of motivation for him in his work as a conservation scientist. He derives much personal satisfaction, he said, from advancing knowledge about wildlife populations and playing some role in their long-term protection. With a master’s degree in wildlife and fisheries science from Penn State, Kubel has worked with a wide variety of animal species during his career, including mammals and birds, but most recently his focus has been on amphibians, he said. “In the big picture,’’ said Kubel, “amphibian populations are important to research, monitor, and understand because they are critical components of the food web and are relatively sensitive to environmental change.